Jas. T. Weeks, Rockville Centre, L.I. 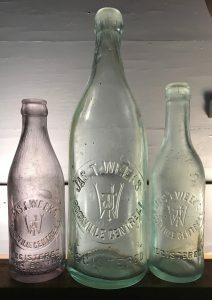 James T Weeks listed his occupation as mineral water manufacturer and as soda water in the 1900 and 1910 census respectively. In the 1920 census, he had moved to Islip and was employed as a driver. The “Annual Report of the Factory Inspectors of the State of New York in 1898 indicated Weeks had a mineral water business that had 3 employees during that time, all male (no address). The same report in 1903 showed water bottling at a Centre Avenue location (no employee information). Based on this information, he was in business from at least the mid-1890’s to sometime in the 1910’s. There’s not much else to go on. All the bottles I’ve found were mouth blown: two 27 oz with a tooled blob finish, several 8 oz tooled crowns and one siphon bottle. Haven’t seen a machine made bottle, even on the Internet. This supports the time frame of the business as estimated above. Next Next post: Welz & Zerweck High Ground Brewery, Brooklyn, N.Y.